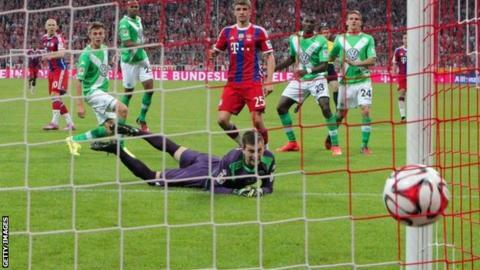 Goals from Thomas Muller and Arjen Robben helped champions Bayern Munich defeat Wolfsburg in the opening match of the new Bundesliga season. German World Cup winner Muller opened the scoring in the 37th minute when he flicked in a Robben cut-back, after the Dutchman had eased past two defenders. Robben added a second after a one-two with new signing Robert Lewandowski after the break. Wolfsburg pulled one back with Ivica Olic's spectacular 18-yard shot. Belgian midfielder Junior Malanda then wasted a great chance to equalise for the visitors, missing from a yard after his initial effort came off keeper Manuel Neuer and the bar. Last season's runners-up Borussia Dortmund, who beat Bayern in last week's German Supercup, host Bayer Leverkusen on Saturday. Match ends, FC Bayern München 2, VfL Wolfsburg 1. Second Half ends, FC Bayern München 2, VfL Wolfsburg 1. Corner, FC Bayern München. Conceded by Max Grün. Attempt saved. Juan Bernat (FC Bayern München) left footed shot from the left side of the box is saved in the top centre of the goal. Assisted by Xherdan Shaqiri. Foul by Kevin De Bruyne (VfL Wolfsburg). Attempt missed. Thomas Müller (FC Bayern München) right footed shot from the left side of the box misses to the left. Arjen Robben (FC Bayern München) hits the bar with a left footed shot from the left side of the box. Assisted by Sebastian Rode following a fast break. Substitution, FC Bayern München. Pierre-Emile Höjbjerg replaces Gianluca Gaudino. Attempt saved. Xherdan Shaqiri (FC Bayern München) left footed shot from the left side of the box is saved in the centre of the goal. Assisted by Holger Badstuber. Sebastian Rode (FC Bayern München) wins a free kick in the attacking half. Attempt missed. Daniel Caligiuri (VfL Wolfsburg) header from the centre of the box misses to the left. Assisted by Sebastian Jung with a cross. Offside, FC Bayern München. Sebastian Rode tries a through ball, but Thomas Müller is caught offside. Attempt blocked. Arjen Robben (FC Bayern München) left footed shot from outside the box is blocked. Assisted by Sebastian Rode. Corner, FC Bayern München. Conceded by Ricardo Rodriguez. Attempt missed. Daniel Caligiuri (VfL Wolfsburg) right footed shot from the centre of the box is close, but misses the top right corner. Assisted by Kevin De Bruyne. Attempt missed. Junior Malanda (VfL Wolfsburg) right footed shot from very close range is close, but misses to the left. Attempt saved. Junior Malanda (VfL Wolfsburg) right footed shot from the centre of the box is saved in the top centre of the goal. Assisted by Maximilian Arnold with a cross. Substitution, FC Bayern München. Sebastian Rode replaces Robert Lewandowski. Corner, VfL Wolfsburg. Conceded by Dante. Substitution, VfL Wolfsburg. Junior Malanda replaces Luiz Gustavo. Foul by Gianluca Gaudino (FC Bayern München). Kevin De Bruyne (VfL Wolfsburg) wins a free kick in the attacking half. Attempt saved. David Alaba (FC Bayern München) left footed shot from outside the box is saved in the centre of the goal. Luiz Gustavo (VfL Wolfsburg) is shown the yellow card for a bad foul. Attempt missed. Daniel Caligiuri (VfL Wolfsburg) right footed shot from outside the box is high and wide to the right. Assisted by Kevin De Bruyne. Substitution, FC Bayern München. Xherdan Shaqiri replaces Mario Götze. Gianluca Gaudino (FC Bayern München) wins a free kick in the defensive half. Substitution, VfL Wolfsburg. Daniel Caligiuri replaces Vieirinha. Offside, VfL Wolfsburg. Kevin De Bruyne tries a through ball, but Maximilian Arnold is caught offside.